Since we are involved in off grid solar power systems, we have a need to monitor battery voltage. 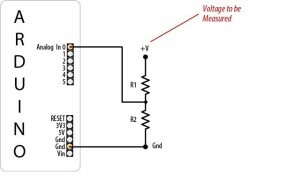 The Arduino can do this easily with a simple voltage divider. With some simple mods, we can control loads, generators, or notifications based on battery voltage. Do not connect more than 5 volts directly to an Arduino pin.